The bombings alone didn’t force Anout and her family to flee their home in a small Syrian town near the border with Iraq. Nor did the missile attacks. Nor the scarcity of food, the closing of all the schools, the loss of electricity. Anout’s family – two boys and three girls – endured all of it. The breaking point came when the local factories, with electricity gone, began extracting petroleum improperly. The oil poured into the ground and the water supply. Anout’s children became sick and suffered skin diseases. “The hospital was only a 30-minute walk. But it was so dangerous to travel there. It was dangerous to be outside anywhere,” Anout explains. Indeed, children in the town hadn’t been vaccinated for a year and a half – proper medicines weren’t available and health workers had fled. Finally six months ago, when her children became too sick and could not get medical care, Anout and her husband, who made a living as pomegranate farmers, decided the cumulative effect of constant violence and deprivation had become too much. They had to leave. They fled to Beirut. But they struggle in their new environment, living with an additional family of five in a 2-bedroom apartment they cannot afford. Anout’s husband is working as a building contractor. Their 15-year-old son Hamad works in a milk factory and has not been to school for more than a year. Anout acknowledges that in Syria, “my children were panicked all the time. They were terrified.” Certainly they are safer now. But when I ask what has happened to her village since she left, the question reduces her to tears. As Anout describes how much they have endured, how much they have lost, her 5-year-old son, Ibrahim, snuggles in close to her and begins to cry as well. Since the war began in Syria in 2011, more than 160,000 people have been killed – though officials say they can no longer reliably calculate the death toll. Over 12 million people have been either displaced inside Syria or fled the country. An estimated 1.1 million poured into Lebanon – that’s more than a quarter of Lebanon’s total population of 4.2 million. The influx has created a massive strain, as Lebanese communities must absorb the additional people and share resources including food, water, shelter and medical services. 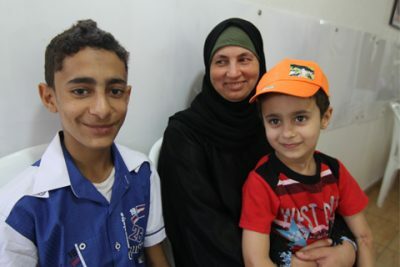 On this day, Hamad and Ibrahim are being treated at the St. Anthony clinic in the Jdeideh district of Beirut. This comprehensive primary health care facility is run by sisters Hanan and Georgette and supported by International Medical Corps, which provides all the medicines as well as health education and training. Hamad has anemia, for which he is receiving iron. Ibrahim, in addition to having a low appetite and being very weak, continues to suffer from skin diseases and has large scars on his left arm. Anout is thankful for the medical care, which she otherwise could not afford. And she tries to remain optimistic about the future. But any hope is tempered by sadness for what she has lost.